Yooka-Laylee is a bright and enthusiastic throwback to classic 3D platforming. It is adventurous and full of discoveries. It is silly and irreverent, never taking itself seriously. But it also wears out its welcome fast, spiraling players into a ceaseless collectathon full of frustrating puzzles, technical difficulties, and aimlessness. It has brought back the best of 3D platforming, but also the worst. Players take control of a cartoon lizard (Yooka) and his bat partner (Laylee) in a journey to collect the pages of a magical tome after it is stolen from the greedy corporate magnate Capital B. Along the way, they dive into various books to explore their inner world. From jungle ruins to the far reaches of space, the duo searches to collect an assortment of shiny tokens and plot trinkets. 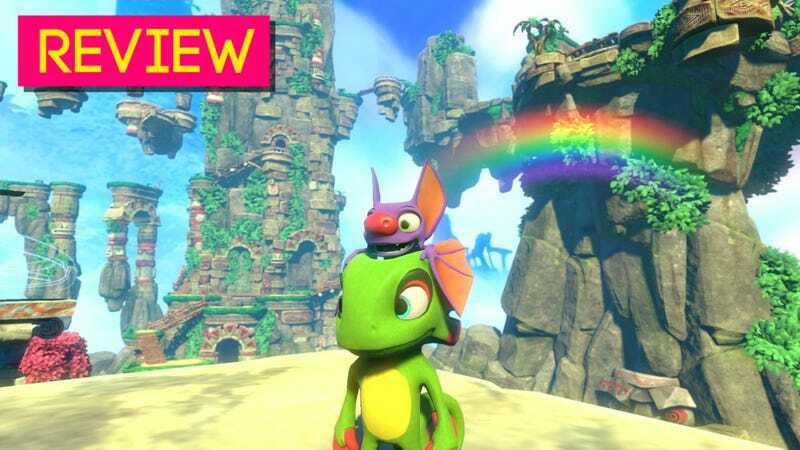 A self titled “Rare-vival”, Yooka-Laylee pulls from a roster of former Rare developers in an effort to recreate the magic of games like Banjo-Kazooie or Donkey Kong 64. It is steeped in the aesthetic touches that made those games so memorable. Bouncy music and sound design brims with arcade charm and the expansive levels full of things to climb and jump look like they’ve leaped from the Nintendo 64. Levels are abstract puzzle boxes, shifting cartoon spaces full of anthropomorphic pals to help. Items jingle musical tunes when you collect them. 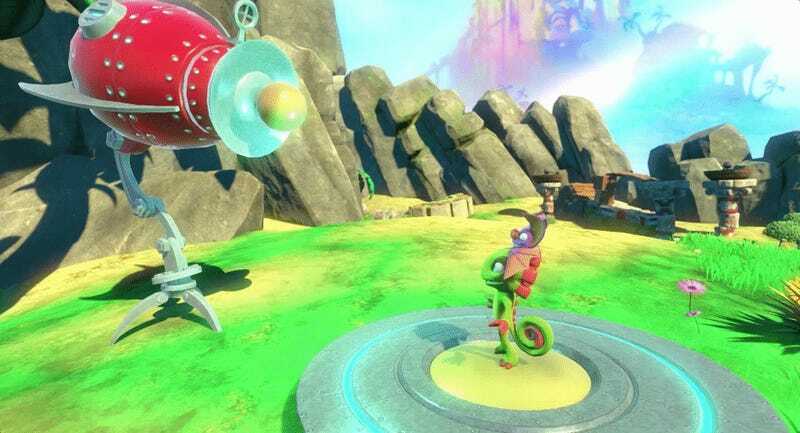 The two lead characters play as a tandem, Laylee riding on Yooka’s back, similarly to how the bird Kazooie pocketed herself in the backpack of Banjo the bear. A mad scientist offers silly transformations in lieu of the tasteless witch doctor Mumbo Jumbo. If anything else, Yooka-Laylee delivers on the promise of nostalgia. Platforming is the chief design concern at the center of Yooka-Laylee. A majority of the game is spent leaping dangerous gaps or climbing large structures. Yooka-Laylee’s strongest aspect is how joyful it is to control. Jumping is quick, with copious amounts of fall control that allows for easy navigation. As you play, you acquire new moves such as the ability to soar into the sky or roll around in a tight ball. The game even includes a Sonic the Hedgehog style spin-dash. There is a clear care placed into the game’s controls. Moving around Yooka-Laylee’s game world is consistently enjoyable. There’s a hell of a lot to explore here as well. Yooka-Laylee is a huge game. 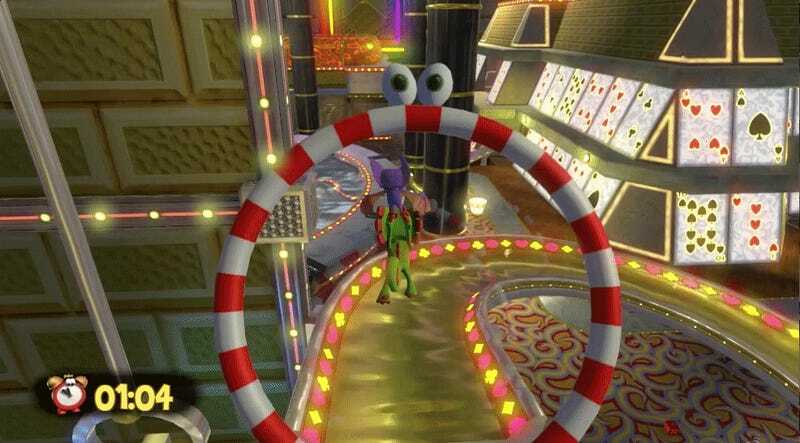 Although there’s only five levels, the game allows you to expand their size by spending some plot tokens. The levels are large to begin with, packed with hidden collectables. Watching them balloon in size is exciting. It feels like the developers are adding a new section to a theme park. New mountains will spring into being and previously unreachable sections of a level will open. It’s an intelligent piece of design that adds dynamism to the levels. The worlds feel very much alive. They transform and grow. The inhabitants adjust to the changes. It’s like turning the page in a story book. Yooka-Laylee is a varied game, almost over-eager to impress. 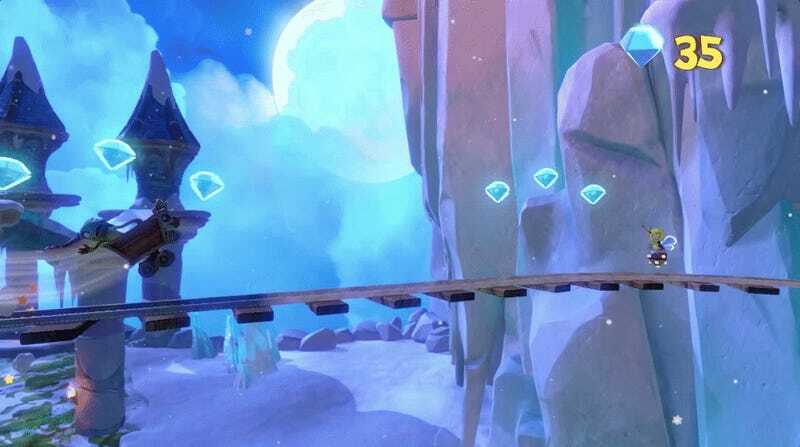 While a majority of time is spent on exploration and platforming, levels hold numerous side activities. There are races down slides, arcade tribute games in the style of the NES’ Micro Machines, combat segments, stealthy sneak missions using your chameleon powers, Donkey Kong-style mine-cart challenges, and isometric dungeons. The check-list is enormous and impressive. Old school mine-cart segments are fun but they demand a near perfect performance. The Yooka-Laylee team’s effort to consistently surprise comes at the cost of any consistent tone. The game’s energy is manic, whipping back and forth. At the worst moments, it seems desperate and lacks coherency. For example, during one stretch of gameplay I went from a platforming race to a memory puzzle and to a pachinko game within the span of ten minutes. I was enjoying the challenge of exploring the world but suddenly the game wanted me to play a knock off version of Temple Run and then test my luck at slot machines. After a while, it gets exhausting. This wearing of the game’s welcome is intensified by the occasional eruption of technical difficulties. Frame rate will dip, the camera will launch into conniptions, and you might launch yourself into a wall. It’s wacky stuff. Too wacky. Playing Yooka-Laylee for any great length of time reveals that the center cannot hold. The initially exciting worlds start to become confusing as the means to collect new items become increasingly convoluted. Find the raincloud and feed him water, dive into the river and hit the switch, then chase a trinket through a bubble maze. Find the piglet, solve his riddle, climb a mountain, fight a boss, find the next piglet, and keep going. Treasure lies at the end of the rainbow, we promise! You’ll stare at sections of the level which undoubtedly guard collectables without any clear conveyance of how to proceed. There is satisfaction to be found in discovering the solutions but Yooka-Laylee is horrible at explaining itself. More often than not, you’ll find you’ve bypassed intended solutions that require absurd feats of platforming. Silly transformations let you explore levels to their fullest. Backtracking is common, with newly unlocked abilities providing solutions to puzzles that you first saw hours ago. I wasted hours in-world trying to unlock their secrets before realizing that I’d need to return much later to complete it all. Banjo-Kazooie had large worlds but mostly gave you all the tools you needed to complete them upfront. Yooka-Laylee teases you with treasure, collectable Chekov’s Guns that only fire five hours after being introduced. You’ll tackle obstacles through spiteful obstinance rather than encouragement from the game. Pacing becomes a problem. The game seems to revel in your confusion and no amount of self-aware joking or camera mugging excuses the descent into aimless wandering. It too often feels like the game is wasting your time. This is no more clear than an astoundingly stupid decision towards the middle of the game. Having endeavored for hours to reach what was ostensibly the end of the game and continually being informed that the end was in sight, I reached the door of the final boss only to be informed that I needed to double my collection of magical trinkets in order to proceed. I would have willingly returned to Yooka-Laylee’s bright worlds on my own time. Instead, I put down my controller and stopped playing. It’s an audacious and transparent attempt to extend game time. Yooka-Laylee wants to be loved. It wants to be your best friend and pulls out all of the stops to captivate the player. It preys on nostalgia, offering a host of colorful characters, awesome levels, and goofy gameplay. These are the aspects we look back on fondly when recalling Banjo-Kazooie or Super Mario 64. Yooka-Laylee promises all of these things and more. It dangles a dreamworld before the player bustling with possibility. It doesn’t just promise a fun experience; it teases a return to childhood. It’s a trap and all that remains is a fawning game that refuses to let the player go. What starts as playful and inviting slowly devolves into a digital hostage situation where players need to pay a hefty ransom to proceed. Yooka-Laylee works best when sticking to the basics. The platforming is great. There was a missed opportunity with Yooka-Laylee. It seeks to recapture the feeling of bygone games but doesn’t seem concerned with correcting any particular shortcomings. What might have been a streamlined version of childhood classics shifts into a game that not just accurately recreates their gameplay and aesthetics, it also revives their glaring shortcomings. Those old Rare games weren’t perfect. They frustrated just as much as they delighted. They also sometimes wasted your time, forcing you to collect too many bananas of too many colors to get to a meager a late-game reward. Yooka-Laylee is too faithful to those mistakes of the past. Tearing away all of the bloat, Yooka-Laylee is a challenging and satisfying platformer. When it focuses on the basics, it succeeds with considerable flair. Yet, these moments arrive in short bursts that are padded out by confusing and hostile design. They point towards a far more enjoyable game than the complete package. The parts are significantly greater than the whole. There’s fun to be had but it doesn’t come easily. And if I never have to collect another shiny again, it’ll be far too soon.